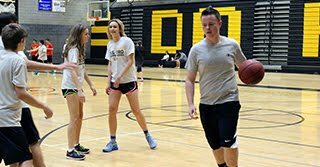 The mission of the Del Oro Physical Education Department is to develop healthy bodies and minds, and promote positive attitudes towards lifetime physical activity, fitness, and skills. With a quality physical education program in place, each student will be empowered with the knowledge and skills necessary to make responsible lifestyle choices that directly impact his/her health and well-being. 1. Aquatics: Emphasis on water safety. 2. Team Sports: Emphasis on rules, skills & strategies of team sports. 3. Combative: Emphasis on basic self-defense moves and concepts. areas of fitness that will prepare them for elective classes offered to sophomores and for athletics at Del Oro. A cardiovascular based fitness class. Activities include fitness games, circuit training, aqua aerobics, step aerobics, walking and jogging. Students will also develop fitness through weight training. Students will assess their fitness level, set goals, and learn to set up a training program to reach their goals. Information on body image, nutrition and a healthy life-style will also be covered. This class is for students wishing to further their current skill level/knowledge of the game & related topics. Units of instruction include: fundamental skill development, weight training, foot speed development, team and situational play. This class is offered to sophomores 0 Block in the fall only. Approval of instructor is required. This course is designed for female students who are interested in improving their physical skills for an enhanced athletic performance. The course will include beginning and advanced techniques in weight training, plyometrics, core strengthening, speed, quickness, flexibility, and sport specific conditioning. It will also include instruction on life-long healthy fitness skills specifically for females. Mental training may include but is not limited to, psychology and sociology of sport, mental toughness and motivational skills. diseases (covering noninfectious and infectious diseases); body systems; drug and family life education. This is for students wishing to further their current skill level and knowledge of the game. It may serve as a foundation for the pursuit of interscholastic competition, recreational enjoyment and coaching. Units of instruction will include: Fundamental skill development, weight training, history of basketball, nutrition, individual and team offense, individual and team defense, situational concepts, as well as the development of self confidence. This new class is offered 4th block in the Spring with Mr. Fee! The Team Sports class is designed to meet the California State Standards for second year physical education students. The main objective is to introduce the students to a variety of motor skills, movement patterns, and strategies needed to perform a variety of team sports. The students will be exposed to a combination of team sports, fitness, and literacy as it applies to the course curriculum.